I bought this awesome mouse pad from How About Orange. She was having a sale in her shop and I couldn't resist. 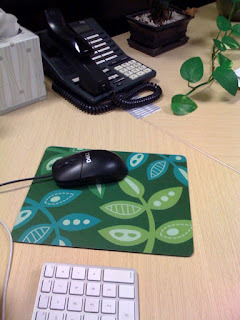 I've needed a mouse pad at my work desk for quite some time. I'm sick of those little flecks of crap getting stuck on the roller ball and disrupting the gentle glide. Doesn't it look great with my desk plant? He's a special vine and certainly needed a friend. No, I'm not crazy. Yes, that is indeed an Apple keyboard you see. I should be banished for using a Dell mouse with it (see post title). Oh if only I had a mighty mouse! That is so cute! I have a grungy old American flag mouse pad at work...I should get a fresh stylish one. Green is my favorite. I can't decide if I want my hair short or long. I'm always in the mood for a cheeseburger.